Shares of Constellation Brands (NYSE:STZ) skidded last year as the diversified alcohol company made a big bet on cannabis with a $4 billion investment in Canopy Growth Corporation (NYSE:CGC). That move weighed on the stock toward the end of year, as marijuana stocks largely fell after recreational use of pot was legalized in Canada on Oct. 17. According to data from S&P Global Market Intelligence, the stock finished the year down 30%. After making a modest investment in Canopy Growth, a leading Canadian marijuana grower, in 2017 by taking a 10% stake for about $200 million, Constellation went all-in on cannabis in August 2018, taking a 38% stake in Canopy for $4 billion and receiving warrants that give it the option to take a majority stake in the company, which is now valued at $13 billion. Investors sold off Constellation stock on the news, pushing it down 6% and signaling they thought the Corona-maker was overpaying for the pot company. That deal would shape the stock's trajectory for the rest of the year, tying it irrevocably to the marijuana industry as the chart below helps illustrate. 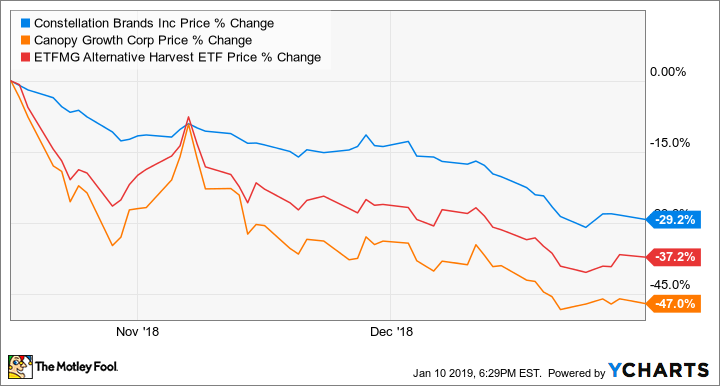 You can see two noticeable downturns in Constellation and its peers, which include Canopy and the marijuana ETF ETFMG Alternative Harvest ETF (NYSEMKT:MJ). The first came right after recreational marijuana became legal in Canada, as pot stocks sold off after they had largely surged going into the big day. Constellation lost 12.6% between Oct. 17 and Oct. 30. The next sell-off started on Dec. 12 after the U.S. Senate signed the farm bill legalizing hemp and sending it to President Trump's desk where he would sign it. Though the bill is good news for the marijuana industry as it legalizes cannabidiol (CBD), a non-psychoactive derivative of marijuana, pot stocks still sold off as it was another opportunity to let some air out of an overinflated bubble. Constellation shares slipped 16.9% from Dec. 11 to Dec. 24 as the broad market fell sharply, as well. Constellation has gotten off to a rough start in 2019. The stock plunged 12% on Jan. 9 when its third-quarter earnings report came out. 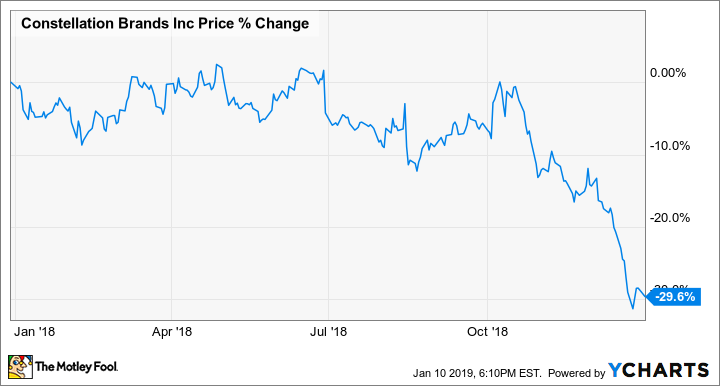 Due to weakness in its low-priced wine business and additional interest expense from the Canopy Growth investment, Constellation was forced to cut its full-year adjusted earnings per share guidance from $9.60-$9.75 to $9.20-$9.30. Management said it would look for strategic alternatives for its struggling wine business, and a sale could be beneficial as it would help the company pay down some of its debt from the Canopy deal. The stock recovered some of those losses the next day as CEO Rob Sands said it was oversold, and investors seemed to agree. While Constellation's beer business remains strong, further pressure in the marijuana sector could affect it again this year. The stock looks affordably priced after the recent sell-off, but volatility is likely to remain, especially after a 5% guidance cut.